First Bloodroot of the Year! Putting close to 15 miles on the trails this glorious weekend, I was noticing just how delayed spring was this year compared with the past several. Harbinger of Spring is about at its peak at the St. Louis latitude, and Spring Beauty and Cutleaf Toothwort are a few days to a week before their peak will be here. But, it is coming. I saw thousands of these plants pushing there way up through the leaf litter along with Dutchman’s Breeches (very cute little buds, I must say). I finally tried the rhizome of the Toothwort today while on a hike at LaBarque Creek C.A. near Eureka. A member of the mustard family, the Toothwort’s small, fleshy and crisp rhizome has a tooth-like appearance, hence its common name. Another colloquial name associated with this plant is Pepper root, also in description of the rhizome. I found the taste to have hints of horseradish and green onion, with a little peppery heat. The perfect size and flavor makes me think it would be perfect in a variety of dishes, including stir-fry and salads. But since it would require killing a lot of plants, I doubt I will make a habit of it. 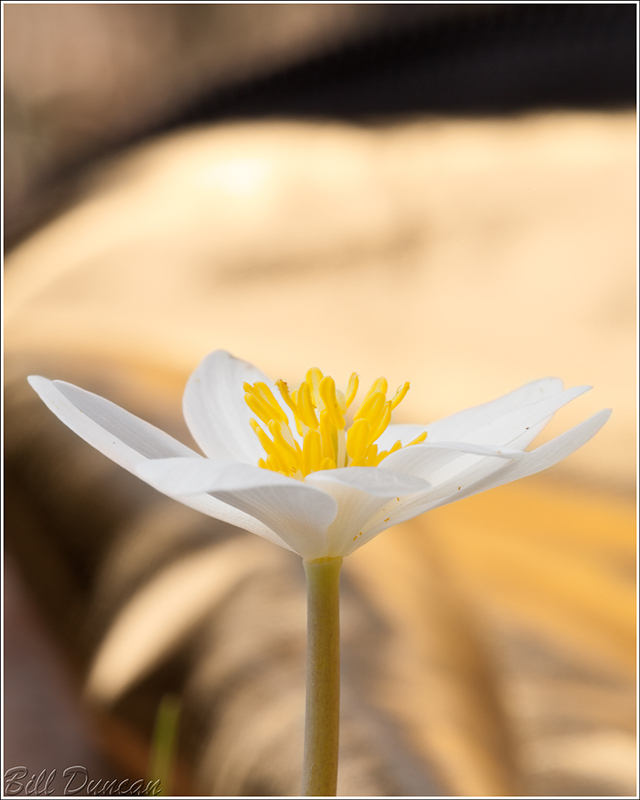 As I was coming to the last mile or so of my hike today, I thought I would once again strike out on my first Bloodroot of the season. But, just in time, I saw a single, fully-opened bloom a couple of feet from the creek. This was the only subject I photographed all weekend, but it was still a grand couple days for a walk. Perfect. Glad you tried and liked the Toothwort! Your description of its taste is spot on.